A super make-ahead snack for sports fans! When presented with this dish for taste testing a few days ago, my menfolk were rendered speechless, in a good way. Meaty, cheesy and full of flavour, it’s scrumptious and satisfying and really does taste exactly like a bacon cheeseburger! It will definitely be on our Superbowl menu this year, and possibly for many years to come. I like to prepare individual-sized dishes of the dip to make it easier to serve and enjoy. Put the chopped, cooked bacon in a large mixing bowl. Sauté the ground beef in a medium-sized frying pan placed over medium heat, stirring often to break up clumps. When the meat is no longer pink, add the chopped onions and garlic to the pan. Stir well and cook 3 – 4 minutes, or until the onions have softened and the meat is completely cooked. Add the meat and onion mixture to the bacon in the bowl. Add the cream cheese to the hot meat mixture and stir to blend well. Add the mayonnaise, shredded cheeses, sour cream, Worcestershire sauce, ketchup, tomato and pickle to the bowl. Stir gently until everything is evenly combined. At this point the dip can be covered and refrigerated for up to 48 hours. When ready to finish, preheat oven to 375F. Transfer the dip mixture into a 6 cup (1.5 L) oven-safe casserole dish (or four smaller dishes). Cook in preheated oven for 20 – 25 minutes, until top is golden brown and sides are bubbling. 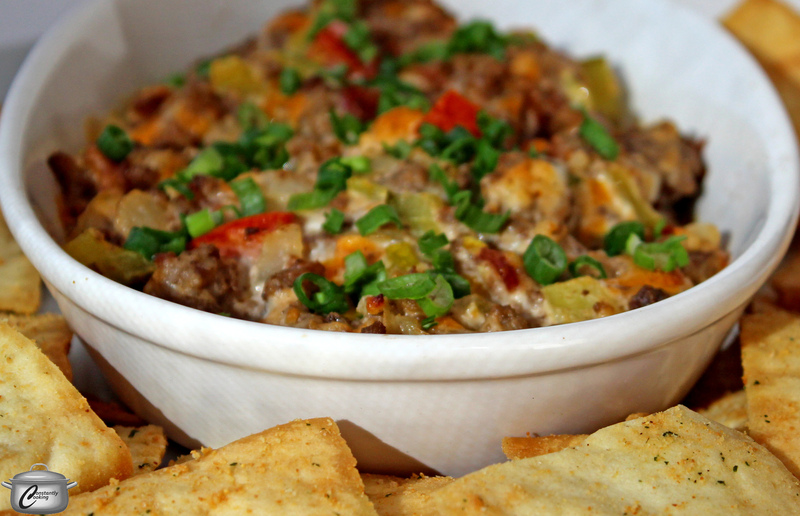 Garnish with minced green onions and serve with your choice of dippers. 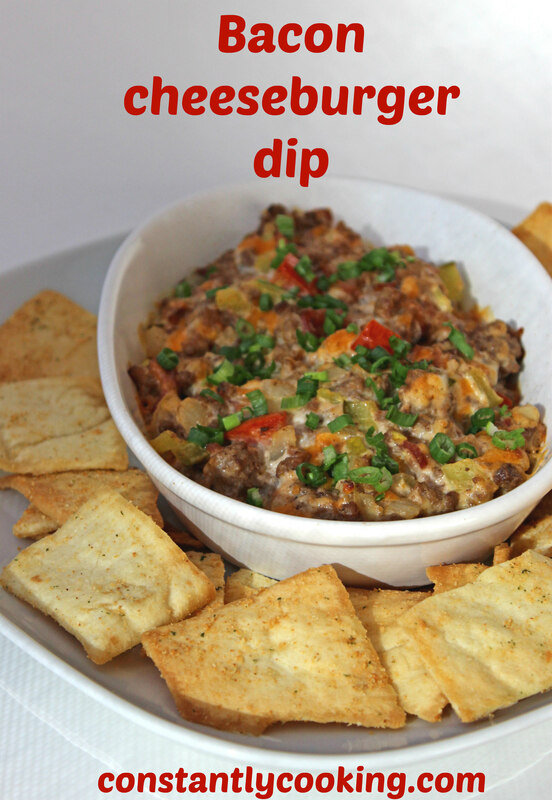 This entry was posted in Beef, cheese, Entertaining, gluten-free, make-ahead, Meat, Party and tagged bacon, cheese, cheeseburger, dip, dip that tastes like cheeseburgers, game time, gluten-free, ground beef, make-ahead, meaty dip, onion, party food, Paula Roy, potato chips, snack, snack food, Superbowl, what to serve at Superbowl party. Bookmark the permalink. You do realize you had me at bacon, right? Though, ironically, too much bacon = heart disease or diabetes which = death. All things (even the most delicious ones) in moderation, right?